Peace on earth and joy all around, declares this adorable CHARM IT! Peace Car Charm. 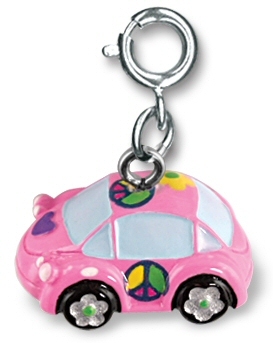 With a 3-dimensional pink body and light blue windows, this delightful Peace Car charm features flower hubcaps, a purple heart on the hood, and colorful peace signs on the doors. With a simple snap of a clasp, girls can personalize their CHARM IT! jewelry with this CHARM IT! Peace Car charm. This adorable CHARM IT! Sun in Shades charm is sure to be a hit with its fun yellow body, cool dark shades, and huge smile.